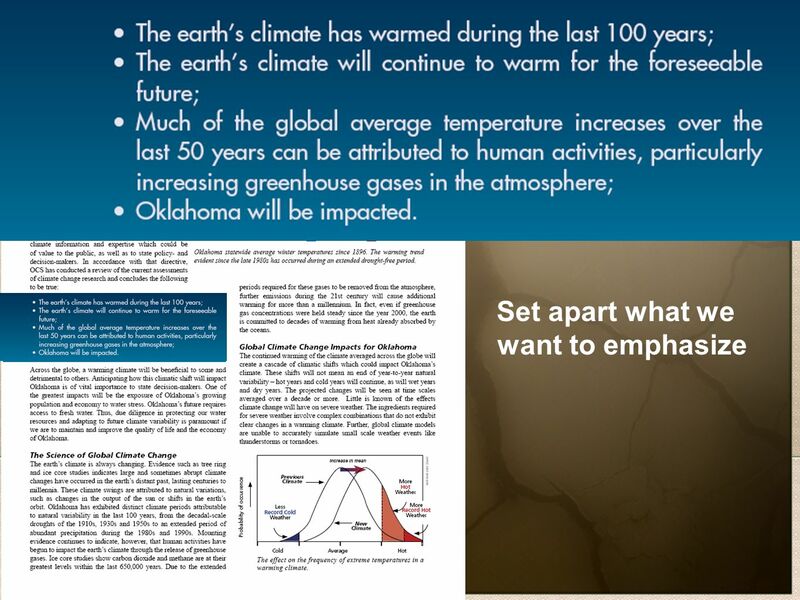 The Formulation and Presentation of a Statement on Climate Change for Oklahoma Gary McManus Assistant State Climatologist. 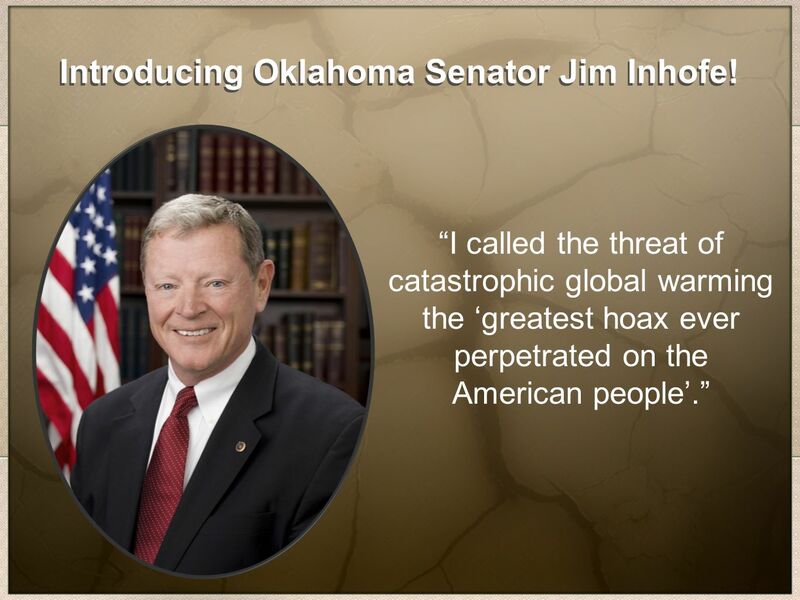 6 Introducing Oklahoma Senator Jim Inhofe! 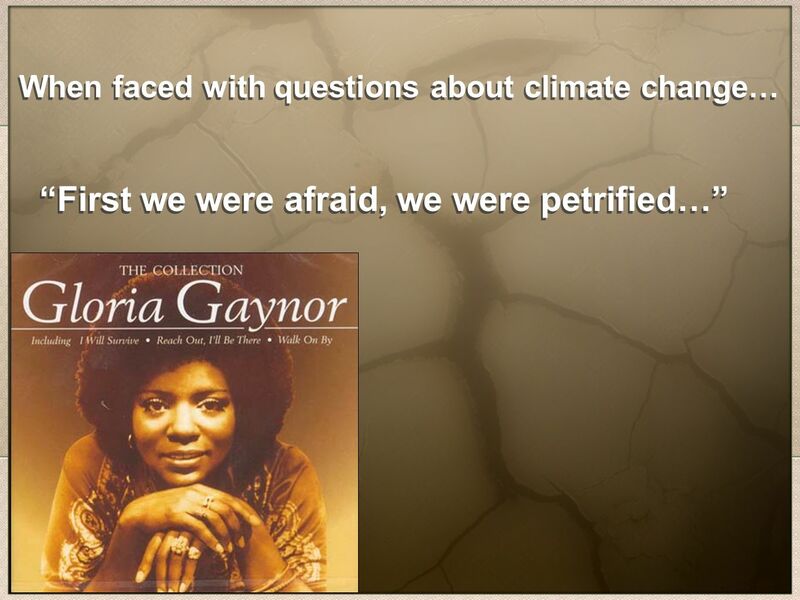 I called the threat of catastrophic global warming the greatest hoax ever perpetrated on the American people. 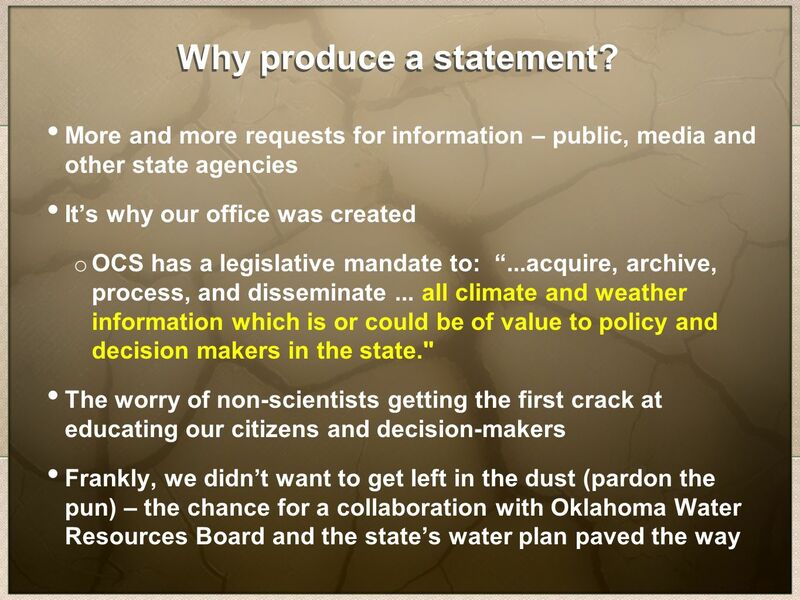 9 More and more requests for information – public, media and other state agencies Its why our office was created o OCS has a legislative mandate to:...acquire, archive, process, and disseminate... all climate and weather information which is or could be of value to policy and decision makers in the state." 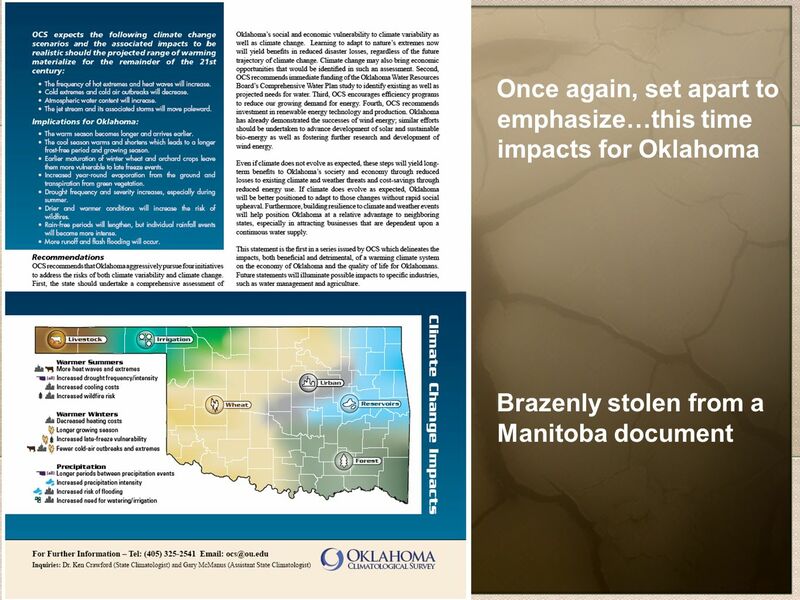 The worry of non-scientists getting the first crack at educating our citizens and decision-makers Frankly, we didnt want to get left in the dust (pardon the pun) – the chance for a collaboration with Oklahoma Water Resources Board and the states water plan paved the way Why produce a statement? 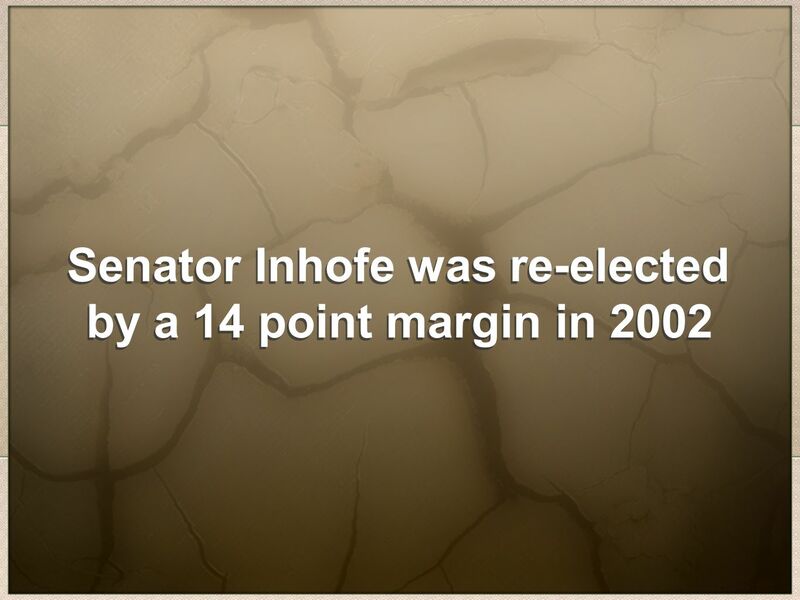 10 In case of GOVERNOR Inhofe... 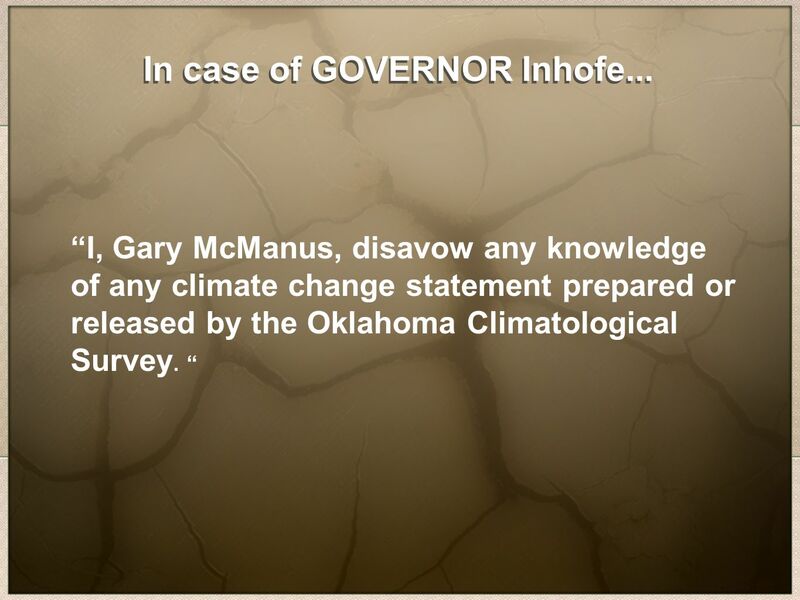 I, Gary McManus, disavow any knowledge of any climate change statement prepared or released by the Oklahoma Climatological Survey. 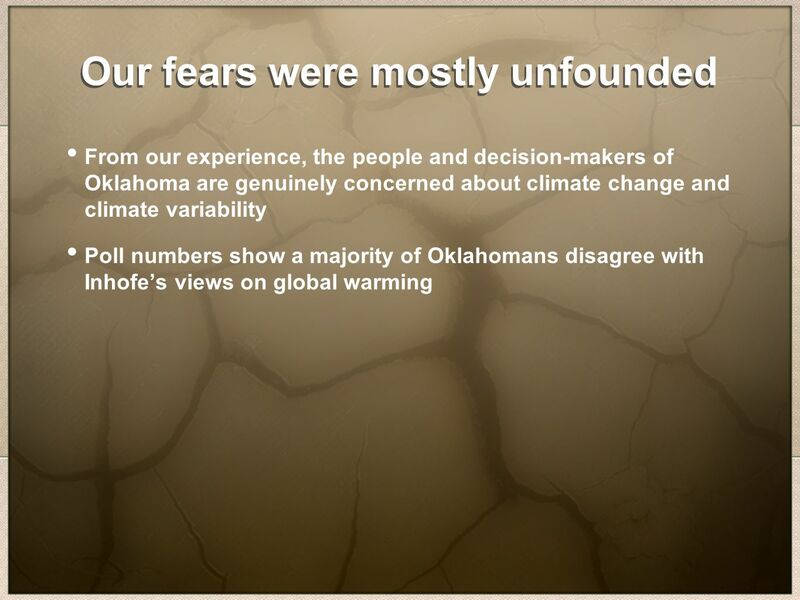 13 After dozens and dozens of talks, experiences have been mostly good My first time out, National Conversation on Climate Change sponsored by Yale, at Tulsa U. 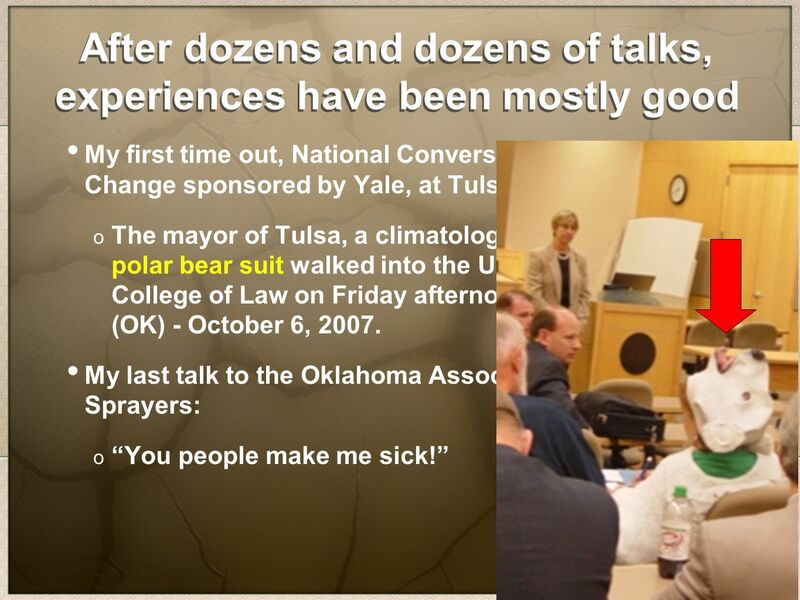 Law School: o The mayor of Tulsa, a climatologist and a woman in a polar bear suit walked into the University of Tulsa's College of Law on Friday afternoon… -- Tulsa World (OK) - October 6, 2007. 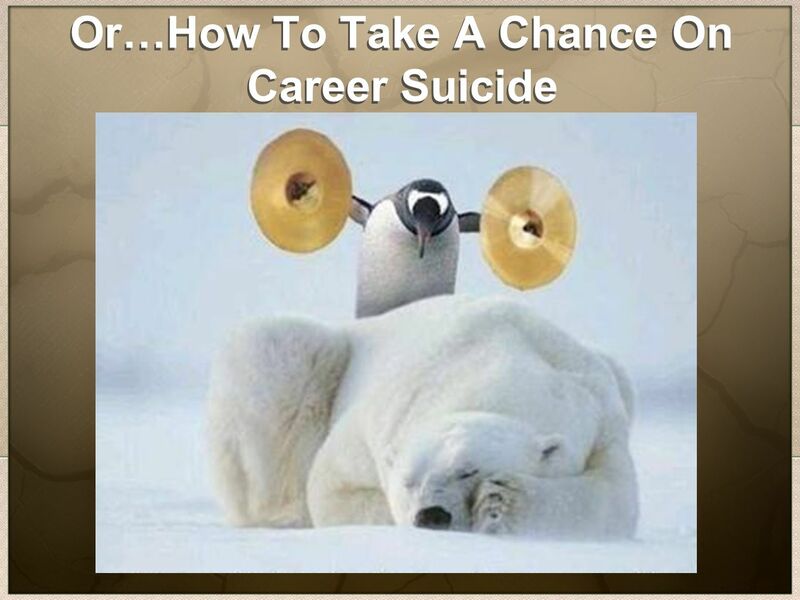 My last talk to the Oklahoma Association of Aerial Sprayers: o You people make me sick! 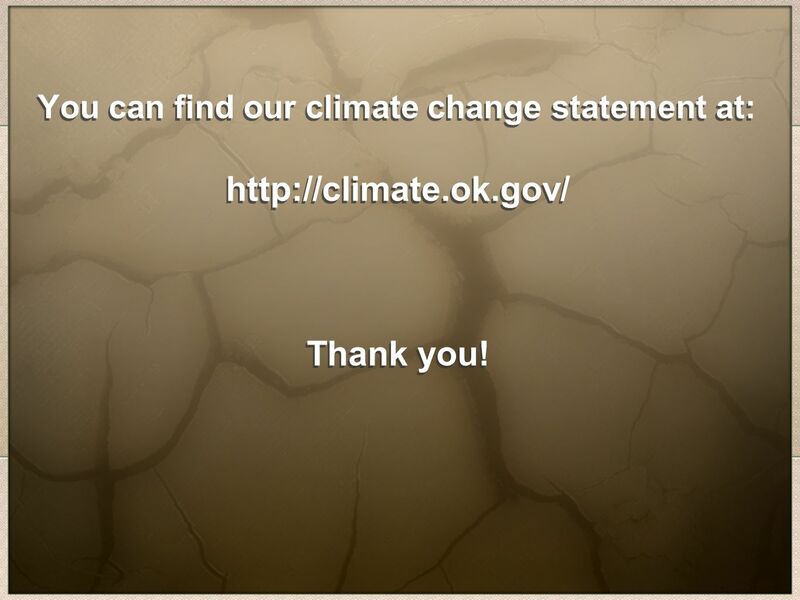 17 You can find our climate change statement at: http://climate.ok.gov/ Thank you! 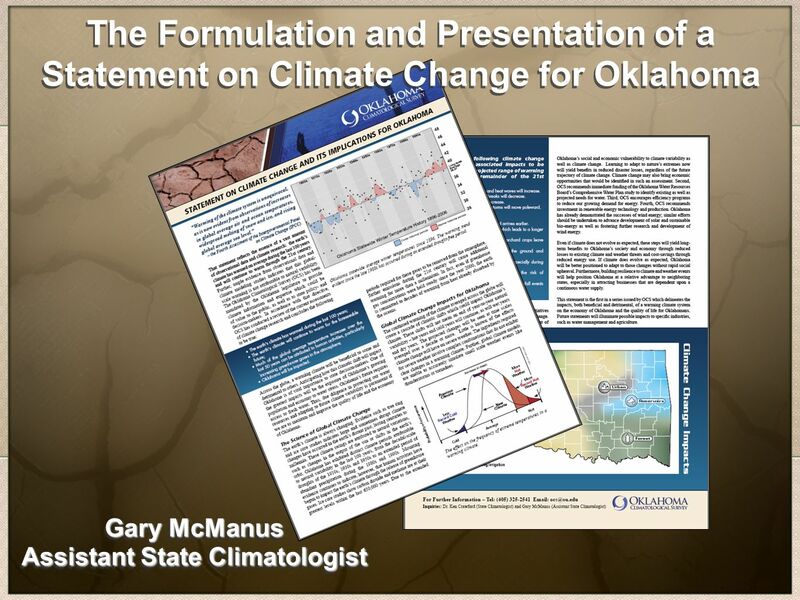 Download ppt "The Formulation and Presentation of a Statement on Climate Change for Oklahoma Gary McManus Assistant State Climatologist." 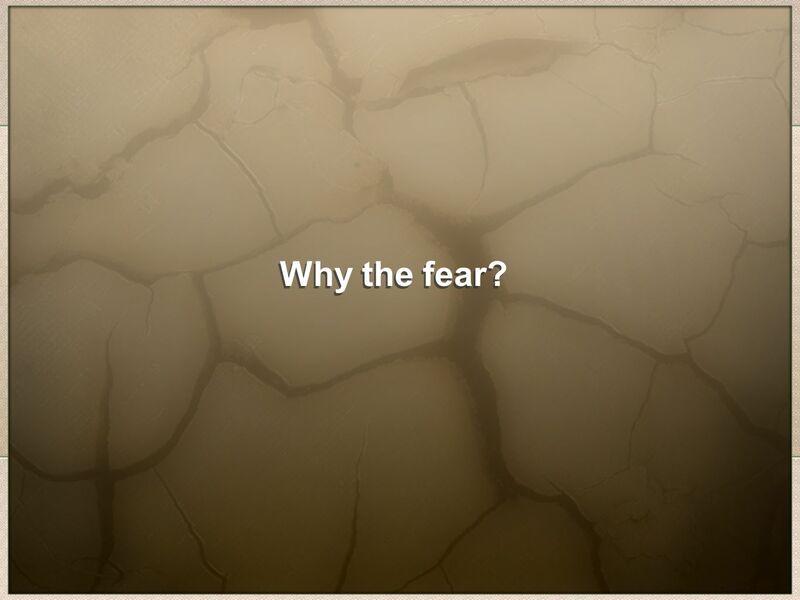 The impact of the UK Freedom of Information Act on records management Dr Elizabeth Shepherd Department of Information Studies, University College London. 2008 AMS Summer Community Meeting 11 August 2008 Welcome! 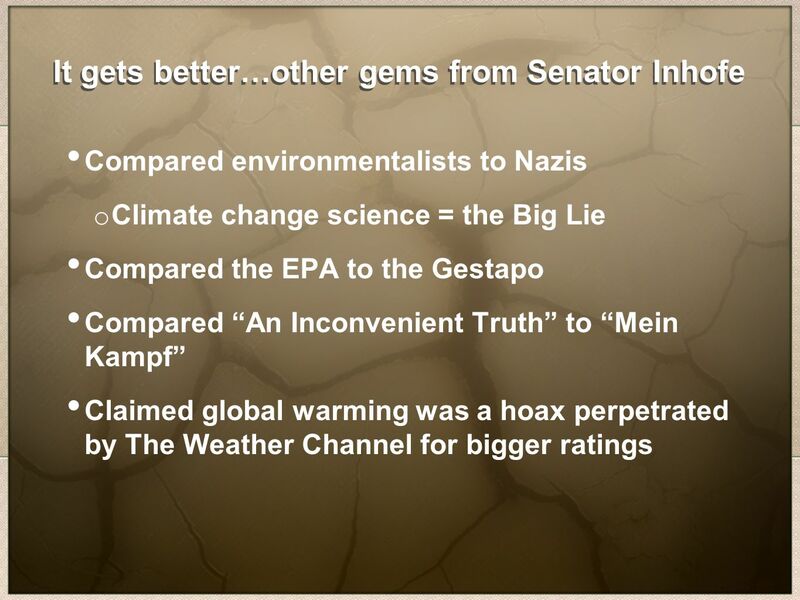 Rick Anthes. 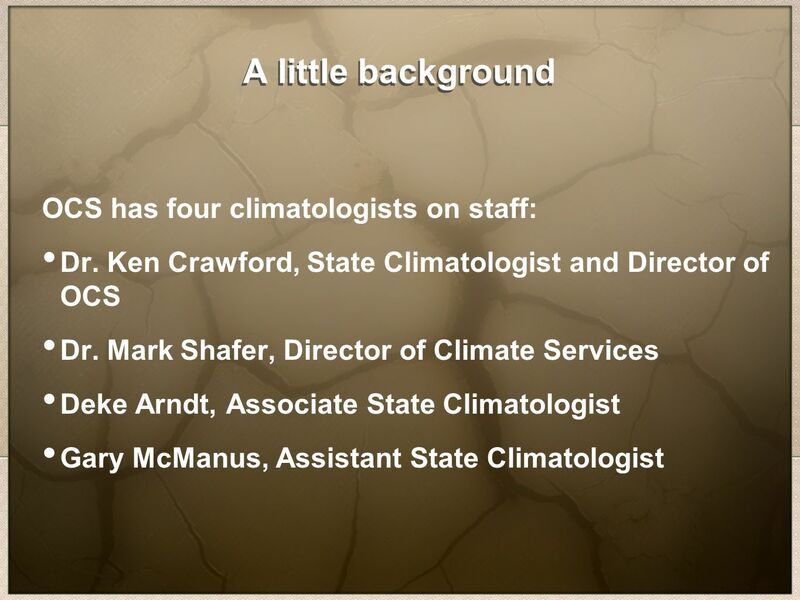 NOAA and OAR Approaches to Research Planning Alexander E. MacDonald PhD Deputy Assistant Administrator for Laboratories and Cooperative Institutes Office. Outreach, Education and Technical Assistance: What We Can Do Differently Jurij Homziak Lake Champlain Sea Grant. Washington, DC 1 AMS Public-Private Partnership Forum AMS Public-Private Partnership Forum April 22, 2008 Dr. Chet Koblinsky Director, NOAA Climate Program. 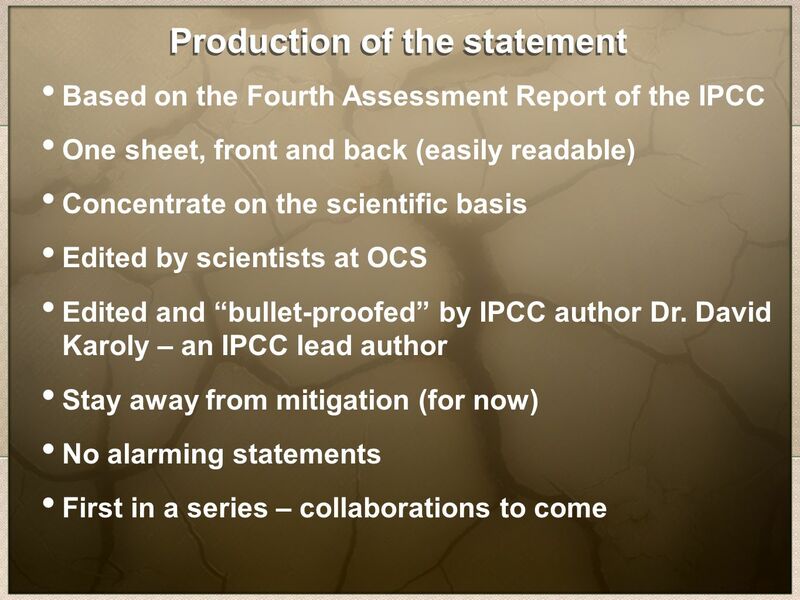 1 IPCC IAC Review meeting R.K. Pachauri Chairman, Intergovernmental Panel on Climate Change Amsterdam, May 14, 2010 WMO UNEP. 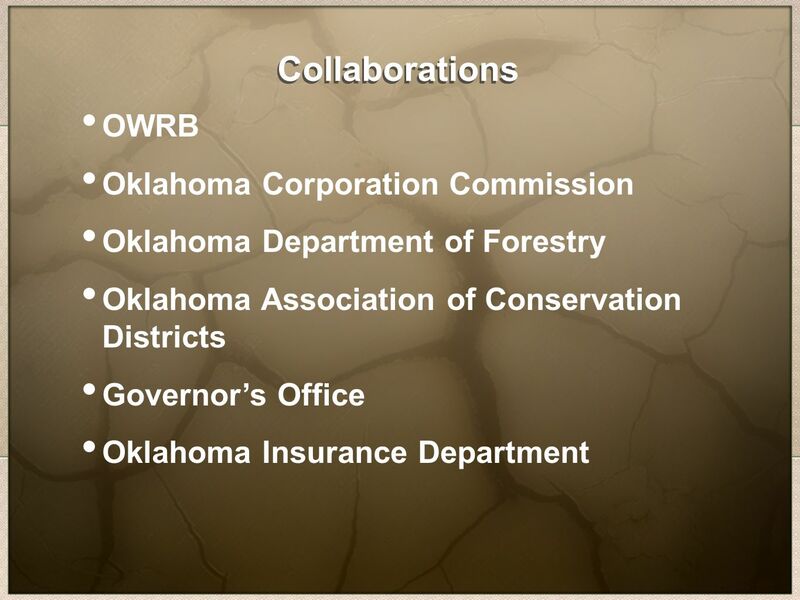 ANRC AACD Arkansas Conservation Districts Training Program Power Point 12 Arkansas Natural Resources Commission. Public Officials/Staff and Public Records You are now a part of Maine’s history!! A Report on Progress toward the Strategic Goals Presented to the Valencia District Board of Trustees on behalf of the College Planning Council. Module 22 STEPS 11, 12, 13 & 14 Washington Level and Administration Review Processes Module 22 STEPS 11, 12, 13 & 14 Washington Level and Administration. Sharing Low-Income Customer Information Water & Energy Utilities LIOB Meeting - January 2009 Seaneen M Wilson Division of Water & Audits.